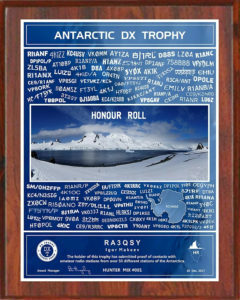 ANTARCTIC DX TROPHY – W.A.P. DX TROPHY AWARDS GROUP issues a trophy “ANTARCTIC DX TROPHY” for QSO ‘s / SWL. with stations in Antarctica. By types of emissionion: CW, SSB, DIGI, MIX, ALL. Confirmation: QSL or LOTW / Сlublog- scans.